Mr Dip Mukherjee qualified in India in 1988 from the oldest, and at that time arguably one of the most prestigious medical college in Asia, Calcutta Medical College. He also obtained a higher diploma in Surgery from the National Board of Examination of New Delhi. Only very few higher surgical trainees obtained this diploma in a country of 1 billion. 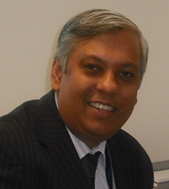 Dip arrived in the UK in 1994 and obtained his FRCS diploma after only 6 months while doing full time work in the NHS. He continued to train in General and GI Surgery and subsequently in the subspecialty of Upper Gastrointestinal and Laparoscopic Surgery and trained in some of the best hospitals in the country gaining experience of fundamental as well as clinical research. Dip has a wealth of surgical experience and is an expert in digestive and laparoscopic Surgery. He's also a trainer and teacher and believes passionately in ethical surgical practice. He lives in essex with his wife and two daughters.